For no expense spared opulence and lavish celebrations, Glendale’s Brandview Ballroom is one of the latest and most impressive wedding reception venues in Los Angeles County. It boasts state-of-the-art lighting and smoke machines that will add instantaneous aesthetics to you wedding photos and reception atmosphere, as well as the capacity to hold up to 550 guests. It may not look so large from the outside, but the Brandview Ballroom is the biggest venue of its kind in Glendale, with 13,000 square feet of space to work with. 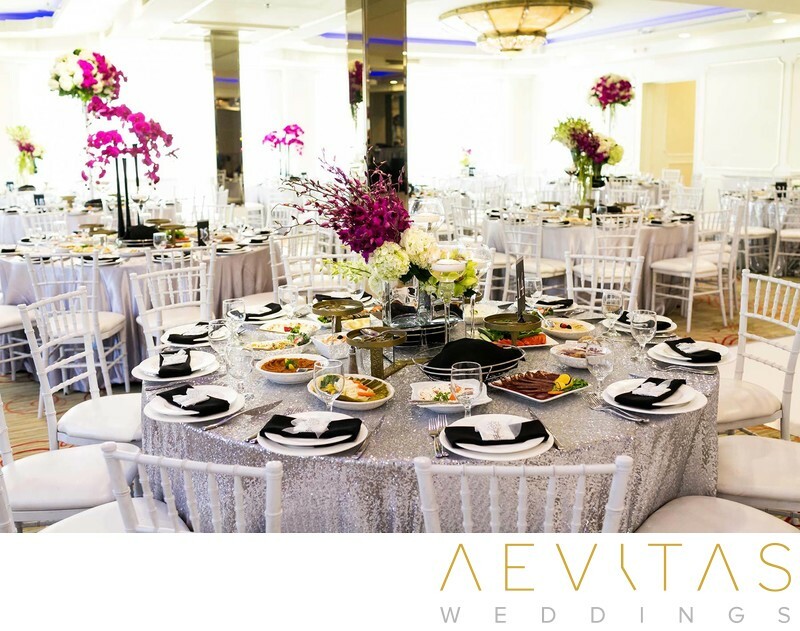 Their expert wedding coordinators and event organizers will help you transform this grand space to cater to your wildest wedding reception dreams, whether that be luxurious glamour or a multicultural themed celebration. The Brandview Ballroom has been set up with the latest in lighting technology, meaning their remote-controlled ceiling lights, spot lights and wall up lighting can be programmed to create the distinct ambiance you are looking for. Combined with an impressive sound system and visual displays, it will be difficult to keep your family and friends off the dance floor. There are elaborate floor-to-ceiling windows overlooking the Americana Mall, as well as a terraced outdoor space where your guests can grab some fresh air. While the lavish ballroom provides the perfect backdrop for glamorous wedding photos, take the time to step outside for some intimate nighttime couple portraits, taking in the ornate Italian onyx chandeliers and grand spiral staircase that exude class and elegance. The Brandview Ballroom works alongside Anoush Catering to provide lavish banquet feasts, but you can also bring in your own caterer if you want to do something a little different. Whether you’re dreaming of an elaborate buffet or an indulgent 5-course meal, you can rest assured that the Brandview Ballroom’s experience in serving such huge numbers will mean you and your guests are well taken care of throughout the evening.